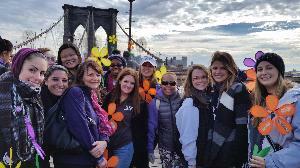 Sigma Kappa is proud to be part of the New York City Walk to End Alzheimer's. As one of our main philanthropies through gerontology research, it is our personal mission to positively contribute to the end of this illness. As a team we believe our motto, One Heart One Way, will speak to the culture we have created and reinforce our beliefs, that we are all in this together. JOIN US in walking to #ENDALZ! Invite your friends, family, & neighbors to spread awareness for Alzheimer's Disease and research. Please find it in your hearts to support our team and the many individuals and families dealing with Alzheimer's.